Everyone wants a safe, happy home. What if an architectural component of your home was causing you and your family harm? You would want to do something about it, right? Feng shui is a philosophy that comes from China. It is based on thousands of years of observation and tradition. Stairs have also been around for thousands of years. Not surprisingly, then, Feng Shui has much to say on the subject of stairs; what is good and what is bad. First, it is important to understand a few basics about Feng Shui. This practice focuses on balancing Qi or energy through the use of the five elements: wood, fire, earth, metal, and water, as well as many other complex systems of measurements and compass directions. What does this have to do with stairs? Staircases are a large, heavy part of your home, and they convey not only people but energy up and down the floors of your home. If they are handled improperly, they can cause harm. In any bad staircase situation, good lighting is always a helpful counter for bad Feng Shui positioning. This is the one of the worst possible placements for a staircase, and unfortunately, it is fairly common in the West. Feng Shui teaches that the front door is the “Mouth of Qi” or the portal through which energy enters and exits the home; therefore, it is extremely important. If your stairs lead out the front door, so does your positive energy, leaving your home sapped. There are several bits of advice as to how to counter this negative effect. Several experts will tell you to hang a mirror on the back of your front door, or just to the side of the door, in order to reflect the energy back into the house, while others caution against it. The reason given for not hanging a mirror is the idea that it “cuts off” heads as they descend the stairs. It is up to you to decide. If you do decide to hang a mirror, the suggested shape is a square, and it should always be inside a frame. A square represents stability, which is what you are looking for. Another option that is not suggested as often is to add plants at the base of the stairs, as they “soak up” some of the energy before it has a chance to leave the home. As a last resort, serious Feng Shui adherents have been known to relocate the front door; just know that this is a very costly option. The center of the home is considered the “heart” in Feng Shui. A busy staircase in place of a stable, relaxed space can mean your life is too hectic. 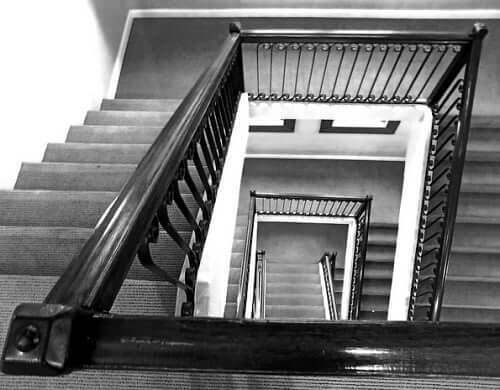 Because of the weight of the staircase, some experts claim it literally leads to a heavy heart, or even division in the family. If at all possible, obstruct the view of this staircase if at all feasible, or even consider a move if you are serious. Have you gotten the idea that stairs in general are not considered good things? It’s true. If a staircase faces a bedroom door, it creates what are called “poison arrows.” This sounds ominous, doesn’t it? Poison arrows are flows of negative energy pointing at the occupants of the space. In this case, it is the owner of the bedroom. It is said that the negative energy can cause health and/or money problems. If the stairs open to a bathroom door, the remedy is much the same as the Feng Shui bedroom situation. This time, hide the bathroom from the stairs, as the bathroom is viewed as the unluckiest and unhealthiest room of the house. The shape of the staircase is almost as important as where it leads. Curved, rather than sharp-angled stairs are best, but watch out for scissor or spiral staircases. Scissor stairs slice back and forth, cutting off a natural flow for energy. As a result, the energy stagnates, and so does the owner’s luck in life, especially if that happens to be the main breadwinner of the family. Matters are made worse if the scissor stairs face the front door, not surprisingly. One suggestion is to wind real ivy strands around the handrails. This becomes a conduit for good energy. Spiral staircases bore a figurative hole into the floor of the home, dragging energy down with them. The worst location for those is the heart of the home. The love, support, and financial well-being of the home drains away. Essentially, stairs are bad for energy in the first place, and anything that cuts or twists the energy flow beyond what is natural creates an even bigger headache. What makes up the staircase – the stairs – is important. You must have risers for each stair. In Feng Shui, when you are seated or sleeping in a room, it is crucial to have your back to a wall. Why? To feel more secure and safe. This is also true of stairs. There is another reason for this, and it also has to do with energy flow. If you think of energy in terms of water or air, it flows along a path of least resistance. That means, with nothing to stop it, good energy will flow down before moving up to the next step. The result is that the second floor receives little, if any good energy. All kinds of problems can result, from bad health to bad luck. The best material to use for stairs is wood. The wood element symbolizes new growth and opportunities. It may generate good energy all on its own, which is precious, considering all the negatives connected with stairs. While it is possible to cover stairs, it is not recommended. Metal is not recommended for stairs, even for the railing, as metal overwhelms wood. One thing is an absolute; do not use red carpet or paint on the stairs. The color red is associated with the element of fire, which symbolizes passion, power, and intensity. Using this bold color would add tension to the energy of the stairs, and if those stairs are at the heart or mouth of the home, it will cause arguments and strife. Some even say that because red is also the color of blood, it strikes a violent image of blood flowing down the stairs. Bathrooms or water features should not be located under stairs, as they are thought to cause health problems. Empty spaces are also considered bad luck. The best use of space under a staircase is to create clean, organized storage area. Some experts suggest storing items that you want to encourage, such as luggage for travel, or money boxes for wealth, or something work-related for luck on the job. This is the only known constructive use for a staircase. This is because the space is known to encourage completion of projects and forward thinking. Notice that it is the space under the stairs and not in front of the stairs that can be useful.